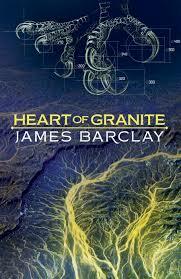 Military sci-fi goes reptilian in James Barclay’s Heart of Granite. But this is not humans versus reptiles as you might think. This is humans using genetically modified reptiles as weapons and transport in a three–way world war over resources. Once the world building is laid out, Heart of Granite settles down into a military mode complete with chains of command, a protagonist with a healthy disrespect for authority and political machinations. After the discovery of alien DNA, mankind used the new technology to bioengineer new weapons of war. A suite of reptilian creatures controlled by humans plugged straight into their brains. Just to set the scene, the Heart of Granite of the title is a kilometer long, thirty legged walking Behemoth, the land version of an aircraft carrier with room for over 1000 crew and equipment inside its genetically engineered body. On board are squadrons of drake pilots, flyboys who plug straight into their dragon-like rides, and ground forces who pilot ‘vehicles’ like the speedy basilisks and slower but more powerful geckos. The plot centres around one drake wing on a single behemoth on the North African front of what is a global war. Max Halloran, a typical cocky flyboy, is part of an elite squadron known as Inferno-X. Drake pilots control their drakes from a pouch under their chests. They are a rare breed, knowing that at some point they will experience something called the Fall where their minds literally burn out due to the connection with the self-willed drakes. But there is something deeper going on – unauthorized experiments on drake pilots, the powers that be willing to make any sacrifice to win the war, and even the Heart of Granite itself holds secrets deep in its body. Barclay drops readers straight into the action. So while the plot takes a while to kick in, there is plenty of engaging world building to be getting on with. And a fascinating and well-constructed world it is. If there is any complaint it is that the reader’s view is constrained by the focus on this single company in a single location of a global conflict. There is little feel for the world outside the theatre of the current battle. But the build-up is worth the effort. By the time the action really kicks in the reader is well and truly invested in Max and his squadmates and able to follow the massive air and land battle that closes out the book. Heart of Granite, much like its namesake is a strange, hybrid beast. It is military sci-fi with a bit of heart. It opens up a new world that, while violent and dangerous, is full of wonder and possibility. While the end is satisfying in the context of the story there is too much world building effort and questions to be answered to stop at a single volume.